Nothing beats the thrill of F1 and at BetStars we’re in the driving seat to provide you with perceptive previews and tips on every round of the World Championship. 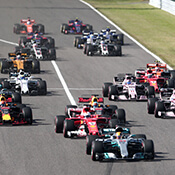 Our team of F1 writers will not only examine the odds on the likely winner but other markets such as the fastest lap, points and podium finishes and first retirements. Rev your engines and get in gear for F1 betting with a difference! The 2019 Formula One season starts in Australia this weekend when Lewis Hamilton will be looking to win his sixth drivers' title to move to within one of record holder Michael Schumacher. Hamilton won his fifth title with two rounds to spare by stuttering over the line to finish fourth at the incident-packed Mexico Grand Prix.